Kaweco Calligraphy Set Review and Giveaway – Pens! Paper! Pencils! The Kaweco Sport is a classic pen and I count my AC and Brass models are among my favourites. Their steel nibs are generally great from extra-fine to medium but beyond that they don’t have the best reputation. I have a double broad nib which is good but a broad that runs too dry. Many people report similar problems, with the feed unable to supply broader Kaweco nibs with sufficient ink. 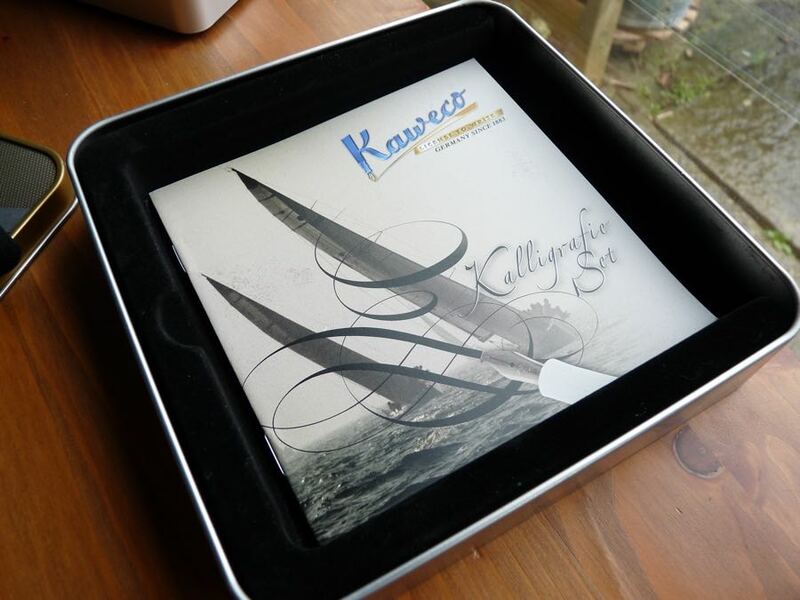 Therefore, a Kaweco calligraphy set is something to be approached with caution. Many thanks to Kaweco for sending me this set to try out. These are my honest opinions. The set comes with four nibs and sections, two sets of black cartridges, three plastic caps, to stop nibs drying out when not in use, and one Classic Sport barrel. I’ve reviewed the Classic Sport before (over two years ago, crikey) so won’t review it again here. Suffice to say it’s a fantastic pen. All this comes in a very nice presentation box. It looks great and is a nice and potentially useful tin but it’s not designed to keep the set tidy once it’s in use. If you’ve got the nibs set up with cartridges in and the plastic caps on, you can’t store them neatly in the tin. You could keep them in there loose but who wants to do that? It’s a shame the tin wasn’t designed to be more than just presentation. The set comes with twelve Kaweco black ink cartridges. This is a good dark neutral ink, just right for calligraphy. 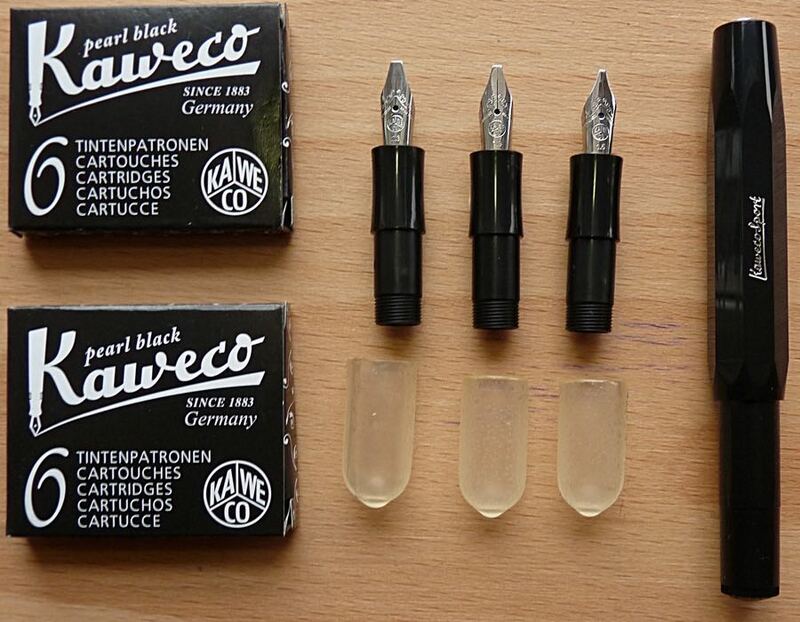 Although Kaweco make a converter for the Sport, it’s rubbish, so you need to stick with cartridges and refill them if you can’t get the ink you want in a cartridge. Fortunately, with them being a standard size, there is a lot of choice. I tried each nib out with one of the cartridges and they all performed well. 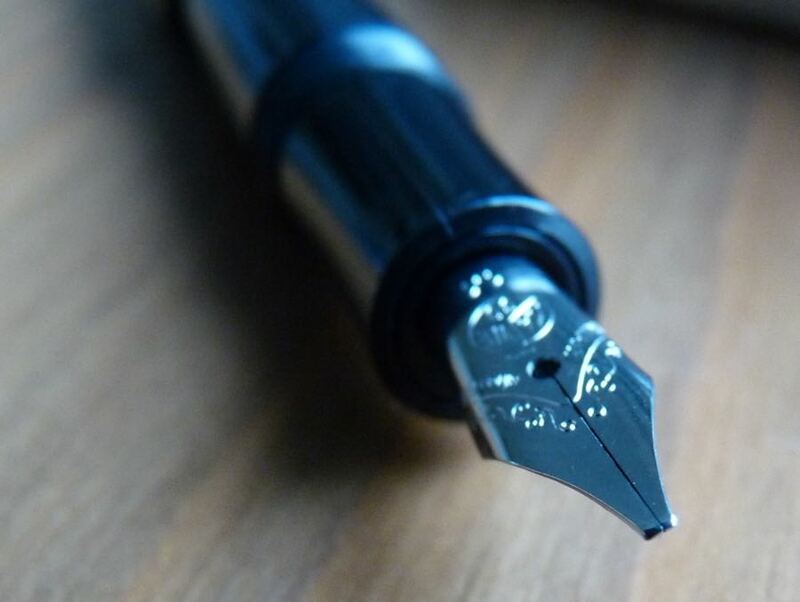 I was particularly impressed with how quickly the nibs were ready to write, the ink reached the nib very quickly. There were no problems with skipping or hard starts with the 1.1mm or 1.5mm nibs but the 1.9mm and 2.3mm missed a little when I tried to write quickly. When I slowed down a little they kept up without problems. I’m okay with how they performed because these nibs aren’t meant to be used for quick note taking: that’s pretty much impossible anyway. When used carefully, for calligraphy, they performed well. I then used a cartridge filled with Pilot Iroshizuku Take-Sumi. This ink has good flow and it performed in the same way as the Kaweco ink. My final test ink was Pelikan Edelstein Topaz. Edelstein inks are a little drier and the 2.3mm nib struggled, particularly with hard starts, which is the last thing you need with calligraphy. Overall, I’m impressed with what Kaweco have done here. Either I got lucky or they’ve done some work to solve the feed problems their broad and double broad nibs so often have. They aren’t perfect, the 1.9mm and 2.3mm nibs in particular need a helpful, free flowing, ink to get the best out of them, but, certainly with the supplied ink, they’re good enough. As you can tell from the writing samples, calligraphy isn’t quite my thing. One day, I hope to get better at it but that day isn’t going to be anytime soon. Therefore I’m going to give this set away. I’m going to do this a little differently this time. 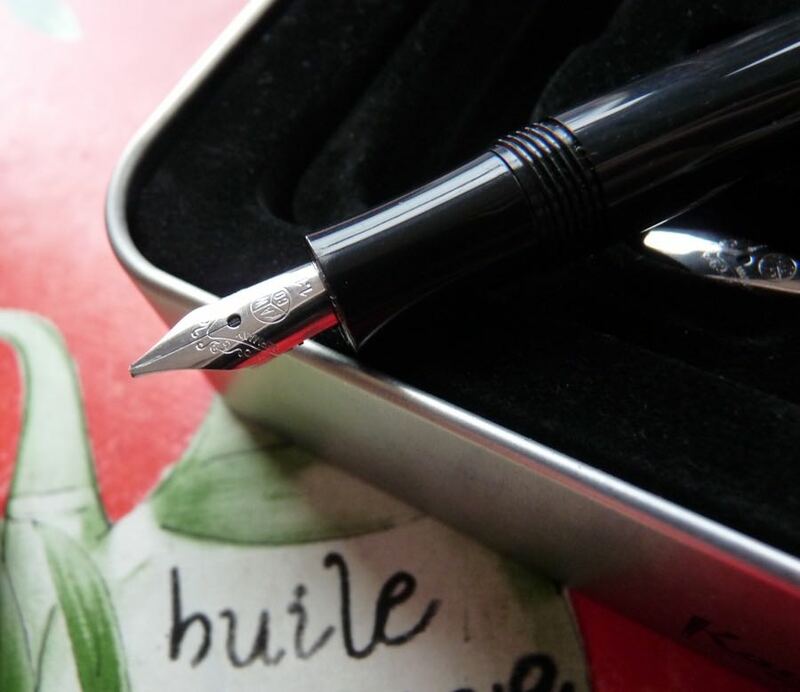 A little while ago I set up a Facebook group: Fountain Pens UK. It doesn’t matter where you live, you are welcome to join, although the focus is obviously around the UK. To enter the giveaway all you have to do is join the group and like the post I’ve put there announcing the giveaway. You can also double your chances by liking the Pens! Paper! Pencils! page on Facebook as well. The giveaway closes at 9am on Saturday 19th December. I’ll put all the likes together and use random.org to pick a winner. The winner will be announced in the Fountain Pens UK group (not on this site) so you need to be a member of that group! The winner will have a week from the result being announced to claim their prize or a new winner will be randomly picked. 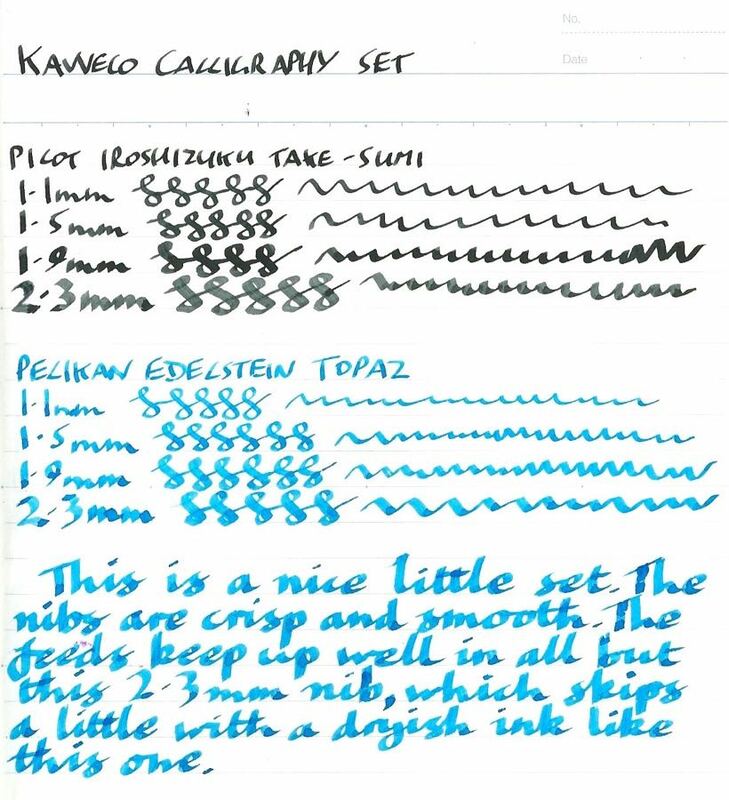 Thanks for the great review; I see it is actually a good calligraphy set for beginners. I gave a like to the facebook page, but I am not joining the group because I’m across the pond =) It is a very nice gift for whoever wins it. Best of lucks! Thanks Clestra. Please do join the group! Everyone’s welcome, and you need to be a member of the group to find out if you’ve won.